Australia’s Biggest Morning Tea month is May. Thursday 28 May is the official day but you can host an event anytime throughout the month of May. It’s simple, fun and best of all for a great cause!All you need to do is set a date, brainstorm some morning tea ideas, invite your guests and raise money to help support the fight against cancer. Let people know about your Biggest Morning Tea by adding the information to the Comments below. Biggest Morning Tea's hope to raise awareness about cancer in the community as well as support those who have been affected in some way so come along and raise your cuppa to help us! We will have a special appearance from Hyper the Clown as well as Darwin Castles! There is a colouring competition running from now until Friday 8th which are available at all YMCA facilities and the Cancer Council office. We wish to thank all of our sponsors who have helped this day become possible! 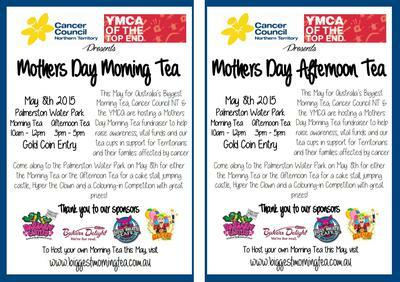 We hope to see you on the 8th May 2015 to support our Biggest Morning Tea and Afternoon Tea!